Far More Than Rubies has finally gotten a face lift! Three years ago we were living with my parents, had no job, and I was really bummed. I won a blog makeover in a giveaway and it was just SO exciting! Two babies, three more years of marriage, and living in two other countries meant that it was just about time for a new look. I wish I had been able to keep my old background and just change all of the other details, because I just loved the "You Are My Sunshine," background. I'm not crazy about my new header picture. One, because I am almost 30 pounds lighter than that picture. And two, because Ian got a ridiculously short hair cut the day before we took that picture and he just does not look normal there. And I suppose my bridal portrait was no longer up to date so I suppose an update of any sorts is better than nothing. Andrea from Slightly Askew Designs did my blog design and I am so happy with it. Andrea has a super cute blog and her family is just adorable. Easter is just around the corner and we are popping up a few decorations and considering focusing (celebrating? honoring?) on Lent this year. We've never done Lent (once again, what verb do you use here?) but I think that the idea behind it is really neat- to focus our hearts and minds on Christ and His sacrifice for us during the days leading up to Easter. We are a few days behind but I believe we can play catch up. and using my friend, Kaylyn's, printable ornaments. I'm glad February is wrapping up, to be honest. It feels like March, along with the coming Spring, will help get me out of my Mom of a Newborn state of mind and I feel like a bear crawling out of hibernation. I'm a little dazed, out of date, and very behind. So you can expect more frequent updates and thoughts from around here over the coming weeks! I absolutely LOVE your new layout!!!! I LOVE the new design! I loved the old design, too! How in the world? I need an amazing design, too! And I think the pictures of everyone are wonderful! Ya'll are very pretty! Goodness, I miss you! 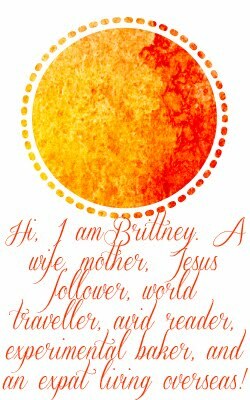 Brittany, you have a lovely blog. I'm stopping by from Miscellaneous Monday. What sweet little girlies and I know you have your hands very full right now. But, I assure you that very soon these days will only be a memory. Enjoy them! Have a happy week!